Relocating or Moving to Kinston, NC? We’ll Roll Out the Red Carpet! The Red Carpet Committee and team of Red Carpet Hosts are ready to show potential newcomers that Kinston, NC and Lenoir County is a great place to call home. Whether they are looking for city or country living, we are ready to impress them with all the amazing amenities that Kinston, NC and Lenoir County have to offer with a dose of Southern Hospitality! The Kinston-Lenoir County Chamber of Commerce and the Business and Tourism Committee members want to help welcome people that are considering moving to our community. We are here to help sell our community! The Red Carpet Committee is ready to share the love we have for this community with potential newcomers. Why wouldn’t they want to call Kinston, Pink Hill, LaGrange and all points in between HOME! If you are aware of anyone that would benefit from this program, please let us know. They will be matched up with a host person or family that has similar interests and falls in their age group. The host will not only show them around our community but become a friend that they can call on. The Red Carpet host can also entertain the spouse and any other family members during the interview process. If you are new to our area or considering a move to Kinston and would like to have a Red Carpet Host, please contact Laura Lee Sylvester at 252-527-1131. If you live in Kinston and love it as much as we do and would like to be a Red Carpet Host volunteer, contact the chamber. To match interested newcomers with a Red Carpet Host/Family with similar interests. To have the host and newcomer spend time together initially touring around our county and/or having lunch or dinner together. To follow up with ongoing contact throughout the next several months in an effort to have them feel welcomed. Provide Relocation packages that match their needs. Help them get connected with information about all our area schools including preschool resources. Let them know that the Chamber’s website has a listing of member Realtors and links to other community websites that may help them. For more information contact: Laura Lee Sylvester, President, Chamber of Commerce 252-527-1131 or llsylvester@kinstonchamber.com. The Red Carpet Gift Card Program is another exciting offer for new residents. We want to welcome newcomers to Lenoir County! And to help the Kinston-Lenoir County Chamber of Commerce is offering a Red Carpet gift card package. This project awards newcomers with a gift card package that has more than 30 business give-a-ways and discount offers. It’s our way to “Roll out the Red Carpet and Welcome them to our community”. Moving to Lenoir County or know someone who is? The Kinston-Lenoir County Chamber of Commerce- Red Carpet program is available to newcomers moving into Lenoir County. This FREE program consists of a gift card package that contains up to 30 business give-a –ways and discount offers to some of Lenoir County’s finest businesses. It’s our way of “Rolling out the Red Carpet to Welcome you to our community”. The Kinston-Lenoir County Chamber of Commerce manages the program and distributes the gift cards. More information is available by contacting the Kinston – Lenoir County Chamber of Commerce at 252-527-1131. There's a reason why Kinston and Lenoir County, NC continue to grow. More and more families and businesses are discovering the unparalleled quality of life our community has to offer. Southern hospitality, a rich history, natural beauty, warm weather, and year-round activities and events are just a few of the reasons many are happy to call the area home. 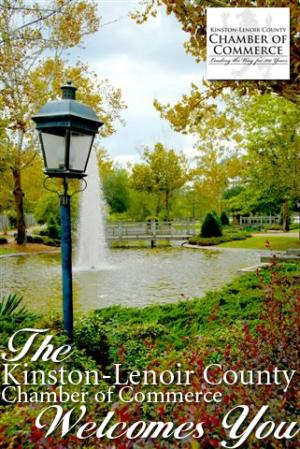 We invite you to bring your family or business to the Kinston, NC area and experience for yourself the charm and beauty of Kinston.